Wireless keyboard offers a compact size with a familiar layout, three-year battery life and instant access to the things you do most. Six hot keys deliver instant access to play, pause, previous, next, volume and mute. 12 programmable F-keys let you easily customize to open your favorite applications, folders or Web pages. Framed keys barely make a sound. Advanced 2.4 GHz wireless offers a long-range wireless connection that virtually eliminates delays, dropouts and interference. Included, tiny, unifying receiver stays in your laptop, and you can easily add a compatible wireless mouse, keyboard or number pad without the hassle of multiple USB receivers. Sturdy, adjustable-tilt legs let you extend them to increase the keyboard tilt by 8 degrees for your comfort. Rubber feet prevent slipping. 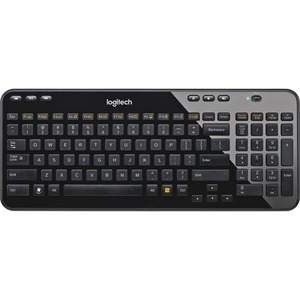 Wireless Keyboard K360 also offers plug-and-play simplicity. Simply plug the wireless receiver into a USB port, pull the battery tab and start using your keyboard right away without software.